Bro.Ken has written an inspiring account of his life and the hard path to inner peace. In today’s fast paced lifestyle, the concept of inner peace is a much needed yet rare commodity. Indeed there has never been a time more in need of inner peace, due to the fact that life today is a hectic struggle to survive and stress is a constant presence in everyday life. In “Do You Have Inner Peace” author Bro Ken has compiled his experiences in life and how, through God’s help, he was able to attain inner peace. The author has lived a fruitful life filled with countless experiences that have steered him in the right path. A devout Christian since his youth, he has always had the belief that everything happens because God willed it so. And throughout his life, he has seen people whose lives’ are ruled by stress. These are the kind of people who live their lives in a state of constant anxiety and irrational fear of the future. In this book, the author endeavors to show people that one should never live in fear of the future because God is a constant presence in everyone’s life. The book also holds a compilation of events in the author’s life that shows how God protected him in all his endeavors. It also shows the reader that the key to true inner peace is to have absolute faith in God. “Do You Have Inner Peace” is a revolutionary work that espouses the author’s belief that faith is the path to true happiness. 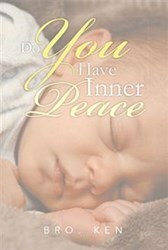 This marvelous book shows how one can truly achieve inner peace through God’s love. Bro. Ken was born in 1942 on a rural rock farm in Central Alberta, Canada. His family moved into the city of Wetaskiwin in 1949, about 22 miles from the area of Pipestone, Alberta. His father took a job with the Canadian Pacific Railroad as a night watchman at the locomotive Roundhouse. On the farm, there was no church of any kind in the area, but his mother was a Christian and read the bible to the family every day. Whenever someone would come out to their community hall and have a service, his family would always be there. There were Lutheran, Baptist, Pentecostal and just traveling evangelists. It was not until the author was 12 years old before he learned that each denomination figured they had the only true teaching. They all preached that Jesus was the Son of God and he died on Calvary's cross for the sins of man and rose three days later, so that they believe in him and call upon him may rise also to be with him in Heaven. This is what the bible taught, and he was taught to believe the Word of God. The first church he attended regularly was The Salvation Army and they preached and lived by the bible. He started preaching in 1971 and ministered in almost every denominational church at one time or the other. He had meetings in town halls, Orange halls, IOOF halls, Legion halls and any other place the Holy Spirit would open the door. In 1989, he was diagnosed with multiple sclerosis. By the year 2000, he was quite limited in his activities. Like a good Christian, he started to complain to the Lord, “You know, Lord, I’m no good. I can’t do anything for you anymore.” The author can just imagine him smiling, as he said, “Why do you think I taught you how to use the computer?” Thus the Food for Thought daily inspirational was started.